One thing the Trump shutdown didn't end was a plan by the Army Corps of Engineers to set off explosives at the bottom of Boston Harbor tomorrow to deepen a shipping channel. It took a judge to do that. Read more. Reports of power outages along Centre Street in the area of West Roxbury Parkway are coming in. Even the Starbucks on Centre Street was forced to close. City Councilors Matt O'Malley, Ed Flynn and Ayanna Pressley will seek permission from their fellow councilors on Wednesday for a hearing to consider the safety of Boston's natural-gas networks - and whether steps can be taken to make it even safer. Read more. At D and West 1st streets shortly after 11 p.m., at least two and possibly three (photo of one explosion). Read more. Meagan Durigan reports Eversource is estimating restoration by 11 p.m.
Matthew Gregoire surveys the scene at North Marginal and Cooper streets. Coast Guard officers look at newly clamped pipe. Photo by USCG. The Coast Guard reports an Eversource electrical conduit under I-93 near the Somerville/Charlestown line was the source of oil showing up in the Mystic River. Read more. Extra soggy Boylston Street. Photo by New England Fire Photography. 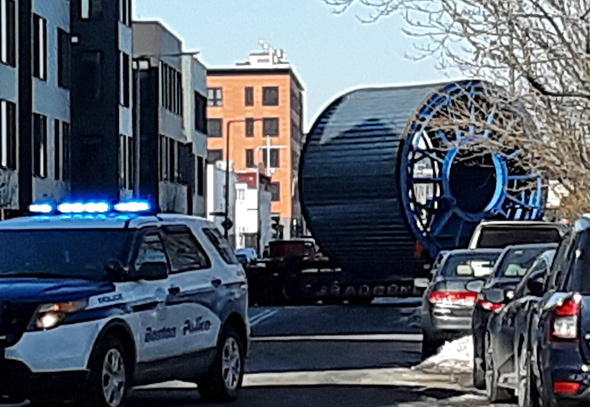 Boylston Street between Tremont and Washington streets is shut until BWSC workers can repair a water-main break caused when some Eversource workers inadvertently punctured the main. The water is flowing towards Washington Street. The Herald reports a West Roxbury Municipal Court judge has tossed the trespassing charges against 13 protesters who tried to block construction of a natural-gas pipeline in West Roxbury by, in some cases, chaining themselves to the pipe or the entrance to its end point at Grove and Centre streets. Read more. Shortly before 9 a.m., people across the city had their lights flicker and their Internet service go down. Read more. Will utility company get pole and wires off Watertown resident's front bannister before next nor'easter? FlyingToaster wonders if Eversource will come retrieve its pole before the Tuesday storm. The pole snapped and fell in the last nor'easter. As of 11:45 a.m., the state was reporting 358,952 powerless homes and businesses - some still out from the first nor'easter. In Boston, there were 664 customers without power. Eversource is estimating 10 a.m. for restoration of power to the 2,600 or so homes and businesses that lost power in Brighton this morning. Map of the new substation. 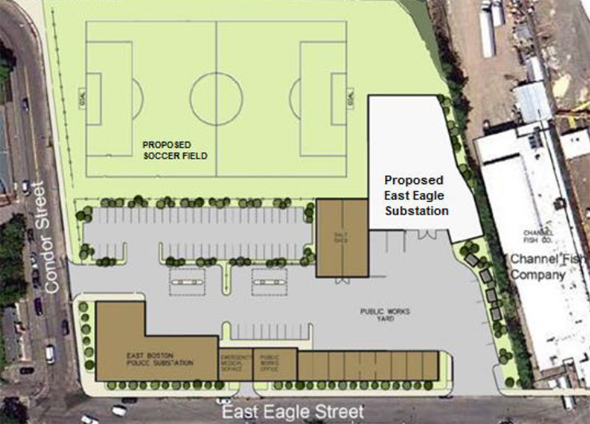 State energy regulators have given Eversource the go ahead to build a large new substation near Chelsea Creek, off East Eagle Street, and connect it to new transmission lines across the creek in Chelsea and Everett. Read more. 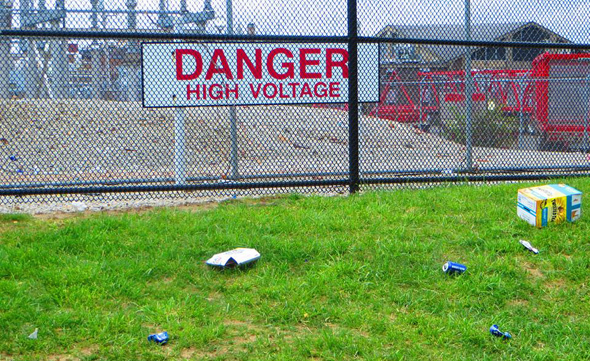 Park next to the substation where the Harborwalk now ends. Photo by Eileen Murphy. State energy regulators have signed off on plans by Eversource to expand its K Street substation in South Boston. The plans include connecting two parts of the Harborwalk path that now end near where the new equipment will go. Read more. Rick Macomber shows us the scene on Truman Parkway at Dana Avenue in Hyde Park around 4:50 a.m., after a dump truck unloading asphalt for the Truman repaving project took down power, phone and cable lines. Read more. The company currently reports 630 customers without power in Boston and 268 in Somerville, but says the majority should have power back by the stroke of 12. CommonWealth reports the state Department of Public Utilities is going to investigate an allegation that Eversource helped raise electricity rates by futzing around with the supply of natural gas used to generate electricity around here.